By transforming the stereotypical role of motherhood into one of political activism, Women of Zimbabwe Arise both redefined and took advantage of repression. This text is adapted from “The Paradox of Repression and Nonviolent Movements,” edited by Lester R. Kurtz and Lee A. Smithey for Syracuse University Press. The idea of tough love emerged and added value to the role of motherhood we embraced. Tough love is the disciplining love a “mother” uses for a “child” who has gone astray or is disrespecting the family. Robert Mugabe and members of the ruling Zimbabwe African National Union-Patriotic Front, or ZANU-PF Party, are first and foremost children of Zimbabwe, who are disrespecting the “family” — the nation. For us, as women, our issues were not about political rule but about the everyday issues that affect us and our families. Finding our kitchens empty and the cat using the stove to warm itself, we moved from the kitchen to the streets. We found we had a talent for organizing and put nonviolent direct action behind our collective voice to loudly demand dramatic changes for Zimbabwe and to call for Zimbabweans to choose love and unity over hatred and violence. Forging a culture of resistance among courageous women, WOZA helped women to overcome their fear of the repressive forces governing the country. Following the words of Gandhi, we looked upon time spent in police custody as a trip to our fields to plant seeds for a good harvest. So, we turned arrests into a celebration of successful resistance. We regarded our time under arrest as a chance to “workshop” or educate the police officers about human rights and to correct those in positions of power who harassed us. We called on them to stop their childlike behavior and abuse of power. Because we were able to play our motherly role so well and with such love, we were able to make our persecutors respect us and appreciate the issues that drove us into the streets in protest. With demonstrations of love — even for arresting police officers — WOZA women provided the nation with a new way to hold policymakers accountable. The high-visibility protest with women speaking truth to power shocked the nation out of its complacency. This form of tough love also challenged a deeply polarized political environment, opening up a new space in the center white line on the “highway” of Zimbabwean political life: women standing their ground on their issues demanding attention as the politicians and citizens drove by to the left and to the right. Tough love was a litmus test to prove that the power of love can overcome the love of power. WOZA was founded in 2002 at a time when a raft of unjust laws were put in place in Zimbabwe, entrenching dictatorship and closing down space for any form of resistance. With the media now restricted, the Public Order Security Act then limited the association and assembly of citizens. WOZA was established to create a collective voice for women to speak out on their everyday issues. WOZA wanted to empower them with knowledge and nonviolent direct action skills and thereby provide a platform for them to demand social justice. WOZA knew that this mandate would also challenge the authoritarian rule of Robert Mugabe and that this empowerment would build a new foundation for democratic change. Robert Mugabe’s rule emerged from a protracted violent struggle for independence in Zimbabwe in which he played a minor role. Mugabe’s initial overtures of tolerance and forgiveness were quickly overturned by elite pacts and patronage systems to keep the military in check and to maintain the loyalty of a partisan civil service that held the nation hostage with liberation rhetoric and false appeals for social justice. A one-party state was being set in place, and the dictatorship was entrenching itself. During colonial times, the white political system governed Zimbabwe. At independence in 1980, a black ruling elite supplanted this system. This entrenched dictatorship is still in place 37 years later in the form of the ZANU-PF Party, which has politicized all arms of the state, the economy and even the citizens. ZANU-PF has captured democracy, and all citizens are supposed to give their loyalty unquestioningly. Zimbabwe’s economy continues to bounce along the rock bottom, with over 90 percent formal unemployment widening the gap between the rich and the poor. The crisis of governance has destroyed the education and health systems of the nation, once the pride of Africa, preoccupying citizens with daily survival and leaving little time to mobilize citizen power. Those who find life intolerable have left the country as economic or political migrants, further tearing apart the social fabric of an otherwise peace-loving and always smiling nation. The Public Order Security Act established in 2002 barred meetings of more than three people and required notification of the police regarding any meetings. Meanwhile, the word “notification” was in practice changed into “approval” for any meeting by the police. The Protection of Privacy Act curtailed access to information, so all the various spaces in which people could formerly express themselves or speak out were effectively closing. The ruling party simultaneously co-opted television and radio stations and major daily newspapers to ensure distribution of party propaganda. The nation was thus silenced and rendered unable to organize due to indiscriminate arrests of opposition and other activists by the police and intelligence forces, and life became intolerable for women and their families. Gender discriminatory norms limited their mobility, and poverty constrained their ability to run for the borders and other greener pastures as men could do. When women gathered and started to discuss the formation of WOZA, the silence had become too loud to bear, and the culture of fear that prevailed shot right through to our bones — we had to put our fear aside and act. As women sat and talked, we viewed ourselves as “the mothers of the nation,” still a key phrase in our movement today. We said we had to do something within the role God had ordained for us. We had to be visible to Zimbabweans and show citizens a new way to speak out about ordinary people’s everyday needs. WOZA members wanted to address simple issues of their everyday lives but with far-reaching impact that would touch all Zimbabweans, even the police officers whom we knew would be sent to beat and arrest us: the cost of bread and staple diet of maize meal; the rapidly deteriorating state of the education for our children; prevailing joblessness; and poor service delivery in the health sector. We were deeply concerned about the continuing violence permeating all parts of society, including the increasing domestic violence against women. One of our first protests was over the high cost and general unavailability of sanitary pads for women, a vital and basic monthly need but a major source of female dignity. We also said we would not speak without acting. If we were going to hold the moral high ground — if we were going to do something effective — we also needed to appropriate a very visible space showing love and highlighting our issues in our own language. So, our version of nonviolent strategy is firmly grounded in our gender and our mothering role, so ordained. More than 15 years later, we are still in the streets showing love, speaking about our issues and how they affect us and our families. Because the number of participants is important for peaceful protest, we decided to build a mass movement and invented a democratic structure that could mobilize numbers through a shared leadership model. We wanted to make sure we remained grounded in our constituency. We also wanted to make sure that we could stand on the center white line on the “highway” of Zimbabwean political life, opening a space for these issues and drawing the attention of fellow citizens who had grown accustomed to our highly polarized society. In Zimbabwe, you are either ZANU-PF or you are opposition, and we felt that this segmenting of society could be healed with the spirit of love that we wanted to build and sustain. We chose to stand on issues, not on formal political platforms, and this was the hardest part of our mandate, but we have succeeded in remaining in our own independent space. The Zimbabwean and global human rights networks have also agreed that socioeconomic rights are as important as civil and political rights, and the new Zimbabwean constitution now has an expanded bill of rights to include these. Beyond the realm of politics, it is important to note that patriarchy rules in Africa. When we decided to form WOZA, we realized that the time had come for women to be out front and visible demanding policy change in society. We wanted to show that we are good at mobilizing around issues and organizing within communities on their issues. Just as we organize our families, we can organize in public life. An integral part of the tough love approach is the use of nonviolent tactics and strategies of peaceful protest that deliver visibility, amplify important messages, and motivate us to invent new ways of organizing and communicating. Within our femininity we also found creativity and use this in formulating our protest theatrics. We, as women, are breaking stereotypes and breaking patriarchy as well as the space it commands. We are proud to say that organizing is a skill women naturally command; we quickly commit to a course of action and stay the course to deliver the message. The belief that women must be quietly confined to the kitchen is slowing fading away. We act out our right to make demands, and we expect the police to respect our right to peaceful protest. Many people assumed our strategy was too risky and that we would not be able to build and sustain our movement. We were breaking those stereotypes too. Women are collectively challenging power and unjust laws and rule in a way that builds democracy and empowers individual people to feel that they are whole citizens — we call this the work of EVEolution, not revolution. When one is in custody, every day all detainees are lined up and their names are called. We would face horrid harassment and insults during these parades, and very soon we responded with pride, heads held high. When our names were called we each walked forward saying “human rights defender” while staring the police officers straight in the face. It is quite a feat to be proud when you are barefoot and stinking, having been kept in inhumane conditions, sleeping on hard concrete floors in lice-infested police cells. The police saw that their repression was backfiring, that the core activist base was becoming radicalized and that our movement was expanding and had now won the moral high ground. Police officers were surprised when bystanders shouted at them for beating peaceful mothers of the nation. When hundreds were arrested, crowded into trucks, or frog marched to police stations, bystanders expressed their concerns verbally by telling off the police officers. The police officers were forced to develop new strategies for dealing with us. They adopted tactics, such as conducting random stops and searches, to attempt to prevent the protests from starting or from reaching their planned target point. They set up police cordons around cities to block women from entering the city, directly accusing any woman of being a “WOZA woman.” Police officers thought that if they stopped every woman, they could confiscate any banners and handwritten placards and thus prevent the protest from taking place. This tactic prompted us to restrategize as well — we conducted simultaneous multiple protests using different routes to get to the targeted location and deliver our demands. This new tactic stretched police resources, rendering them unable to stop all protest groups. On Valentine’s Day 2014, our traditional day of protest, more than 150 anti-riot police occupied Bulawayo’s central business district at 8 a.m. in anticipation of an 11 a.m. protest. Police were deployed in groups of four on main street corners. They expected us to be intimidated and fail to enter the city. We not only came to our starting points but ignored the police and mobilized such high numbers that, as we started the protests, the police officers began studying the polish on their shoes in fear while we marched away and reached the government complex peacefully singing. On this occasion, the police were forced to return to their barracks in embarrassment. The state went a step further to try to demobilize our tough love. They used persecution by prosecution. Requiring a person to appear constantly in court on charges constitutes a form of harassment. At one time, I was personally appearing in court on four different charges, with appearance dates synchronized around or in anticipation of known protest dates, such as Valentine’s Day or International Woman’s Day on March 8. The state even concocted criminal charges against the leadership in hopes of criminalizing the movement — this too failed. Despite the efforts of the police, WOZA adopted a high risk mandate during the height of repression. Some might have said what we planned was impossible, impractical, dangerous or foolish, but that would have underestimated the lived reality of Zimbabweans in 2002. We had to do something courageous, something expected of us as the mothers of the nation, and we did it. But to do it well, we had to be able to shove fear aside and put something else in its place. It was important that we break the culture of fear that prevailed in Zimbabwe, and we found that repression often backfired on Mugabe’s regime, especially once people were empowered and fear was replaced with a culture of resistance. An incident in July 2003 illustrates the shift from isolation to solidarity that we experienced. We held a wonderful protest, marching along with placards, singing our songs with our messages, and calling for the repeal of the Public Order Security Act. I said, “Ok, let’s go.” He started to walk with me, and fellow WOZA members turned to walk with me as well. As we marched back through the bus terminal with this police officer, the news quickly spread that I was being arrested. By the time we got to the police Land Rover, it was already full of members who had turned themselves in. There was no room for me in the vehicle, but in high spirits my fellow protesters created room, and I was squeezed in. As the vehicle drove to the nearby police station, other members walked or ran there and marched into the police station, arresting themselves as well. By accepting and even courting arrest, we had taken away the regime’s major weapon of repression, turning it instead into a source of empowerment for the movement and individual participants. What happened to make people so committed and confident about what we were defending together, what our protests were all about? In the culture of fear that prevailed under the Public Order Security Act, most people did not want to be arrested. Our resistance and the solidarity arrests came as quite a shock for the police, and we have maintained and built on that momentum by building a leadership structure that empowers the movement. We also draw energy from exposing injustice, because our members feel they own the issues and that they can be defended through thick and thin. Ironically, during the war for liberation (1964–1979), Mugabe and other nationalists had also been arrested under the public order acts and had promised to repeal these repressive laws. But now, here they were, the so-called liberators, arresting women and charging them under the very same repressive law they had faced when challenging colonialism. The hypocrisy of their use of repression was only highlighted in contrast with our peaceful marches and singing. However, to capitalize on the power of this framing of Mugabe’s authoritarian and patriarchal rule, we had to build a movement that empowered Zimbabweans to overcome fear and take risks. We had to prove that the power of love could conquer the love of power. It would be wrong to give the impression that responsibility always falls on the same leaders. Shared leadership is also important. It is true that, in the first few years, I had to be the one to start the demonstration and call out the first slogans in the center of the street. As with the July 2003 protest, police identified me as the one who started the protest and perceived me to be the “organizer.” Also, because WOZA never formally notifies police of a protest, the police target the one who starts the protest. WOZA actions begin with gathering members together at a central business district point. Then, somebody has got to be brave enough to walk into the street and start the demonstration and open up the banner. So, in the initial phases, I often took on that role. However, I was later able to embolden other people to initiate the demonstration, and now everyone wants a chance to start the demonstration or hold the banners at the front of the march. Leadership by example became shared leadership. The police began to target leaders, hoping to break the growing culture of resistance they had established, and in hopes that people would run away because the leaders were no longer there. Soon, however, there were too many leaders and too many brave faces to remember due to our movement structure. Authorities then tried taking photos of the protests to identify the leaders, but ordinary members increasingly wanted a chance to start the protests. Consequently, the police officers could not keep track of the growing number of faces and names. This also translated into police officers refusing to allow large numbers to be arrested, as the handwritten, tedious paperwork required to process members into detention (along with photographs and fingerprints) meant late-night shifts without overtime pay. By overcoming fear and building collective leadership, we were able to face and effectively manage or blunt repression. The building of a culture of resistance involves a redefinition of repression and of how the system secures obedience. When we challenge dictatorship and patriarchy, we may risk being beaten, but in receiving that beating without retaliating we score a victory for the oppressed. From our perspective, repression is not only a victory for the cause but also an indication that the issue being addressed has currency and credibility. I have been in custody many times with other members, and we are all battered and blue, but we are elated! How can we be so elated and yet also be in such pain? Because in our minds we had planned and implemented a successful campaign, kept nonviolent discipline and neutralized repression. A power holder can only use their power over you if you let them, but by simply flicking the switch and taking our power back, we reverse the roles and disempower the authorities. We also decided not to be the victims of repression but to be the victors, celebrating each victory, which helps shake away fear. This process is empowering and boosts personal confidence, building strength of character and leadership capacity. Interestingly, despite the amount of trauma we have suffered, these experiences are stored not in the negative part of our brains but in the positive side. WOZA members used to have a one-track mind that was always focused on peaceful protest, but we learned that building a culture of resistance requires more than effective protest; it takes building a movement and creating a daily culture of activism — daily vigilance. And so we started to build a movement around the culture of resistance. Not many people realize that 98 percent of our work is conducted quietly through trainings at the community level. We began to conduct very concise, specific civic education campaigns. To build daily activism and vigilance, we translated Gene Sharp’s 198 methods of nonviolent action into all the local languages, built independent activist capacity to plan a protest, and conducted workshops on how to overcome fear. Ultimately, we stress that the 198 methods approach is something people can use to plan and organize around their own local issues by themselves. Building and then expanding the culture of protest helped to maintain the sustainability of the movement by inculcating members with the habit of noting repression but then immediately trying to manage the repression while exposing it as an injustice. Suddenly, the police could not target only certain leaders. There were people doing things in the community seemingly all by themselves and unconnected to the main organization of WOZA, yet operating under the banner of WOZA. Additionally, WOZA found that this decentralized culture of resistance would also strengthen the likelihood that repression would backfire. Police at more suburban police stations live within those communities, are more familiar with bad governance, and quietly support WOZA. These police who live outside the center of official power are less susceptible to patronage and corruption, so they can more easily be pulled over to support people power. Repression is a common experience in our movement, and we work intentionally to prepare ourselves, to build solidarity, to build effective strategy, and to gain advantage despite repression and sometimes even because of repression. We may organize a protest and walk away battered and bruised, and we acknowledge that we have put ourselves in that circumstance. We put ourselves there, and we were injured, but we created a dilemma for the security apparatus. The dilemma presented by our protest could be described this way: “Leave us to our peaceful protest on our issues, which is also your personal lived reality, Mr. Policeman,” or “Beat us and arrest us for our peaceful protest and only you look bad to ordinary citizens for using violence against peaceful women, mothers of the nation. Beating us is also an acknowledgement that our issues carry weight.” We may be injured, but by the repression the regime’s leaders have made themselves look bad. Who won and who lost? We have to be careful about how we define victory: If I am beaten, one could say I was successful at commanding my space with moral authority, which forced them to do something that undermines their moral authority. I do not want to be killed, obviously, but we must take some responsibility for the role we play as activists when we put ourselves out there and challenge authoritarian rule with the tough love of a mother. On Valentine’s Day each year, we hold a signature protest. In 2013, police arrested 20 of our members, mostly young males. In response to this arrest and discrimination, 180 of us marched politely and quietly into the courtyard of the police station in downtown Bulawayo. It fell to a senior police officer to address us. He had been at the scene of the protest and had refused to give the order for arrest. He addressed us in his courtyard saying, “We don’t know how you people got to be here, but anyway, please will you leave?” So, it appeared that instead of being arrested, we were being un-arrested, if there is such a thing. However, we refused to leave because they were keeping the male members in custody, and we demanded that all of us should be released. We proceeded to conduct a sit-in to make sure that we were all released. They had to deploy the anti-riot police to come into the police station and un-arrest us! The police officers started to walk among us hitting their baton sticks against their hands making ready to beat us as we sat there in disbelief at the change of tactic. After a brief consultation, we asked those seated to stand up calmly and walk out of the police station, making the point that we were able to maintain discipline and determine the course of action, just as we had done by entering the courtyard in the first place. We have come to redefine and take advantage of repression while at the same time building a spirit of resistance and collective solidarity. It is a hard fact to understand, but collective action and unity of purpose is more easily mobilized than the blind loyalty of a police constable ordered to beat a woman demanding more affordable food. A democratic movement structure working on issues of concern to the members themselves is much more likely to elicit buy-in than orders flowing along a militaristic chain of command. We must also address fear, which is an underestimated issue. Conducting workshops and refresher workshops on overcoming fear is a vital activity. Due to the courage displayed by top leadership, ordinary WOZA members could have been demotivated in the face of repression — telling themselves that they are not as brave as others. I do not believe fear can be completely overcome, as there are physically occurring symptoms that manifest. But by making fear something even the top leadership experienced, we made ordinary members capable of managing fear. A man once came to me in a supermarket and said, “I am glad you are not wearing a mini skirt, or your balls would be showing.” This was an awkward compliment, but it drove home to me that people think I am a superwoman (or man in this case), when really I am still fearful for my life. It is just that I am more fearful of doing nothing. If you do not recognize that you are afraid, you will not take the next step to overcome fear. There are ways to overcome fear, and many can be facilitated. For example, we conduct workshops covering what to do if you are under arrest and what your rights are during detention. We then insist on detailed planning before we conduct a protest. Planning introduces predictability and helps to dispel fear of the unknown. In the planning session, we go through the details of the issue about which we are demonstrating. We develop a collective understanding of the facts and how they affect us and our families. We then decide on which policy maker we need to target during the protest, what demands we will make, how the protest will start and the route to be taken. We also decide the song that will be sung to communicate the message. All this detail helps members “see” the protest and immerse themselves within it. This immersion process helps prepare protesters to confront all possible outcomes and eventually helps them to overcome fear. We use singing and dancing a lot. In the first few years of our resistance, I was bothered that many people were dancing during the protests, especially the very young. I would say, “Hey, come on, let’s be serious, this is a serious issue.” However, I began to realize that when people begin exercising their freedom on their own terms, they become hooked on their freedom and the empowerment of that space they have created and enjoyed together. It becomes a catalyst for the person’s own self-identity. It builds their personal confidence and makes them feel, “I can do this. I can lead others doing this.” It gives them their full citizenship, and this is a joyful achievement. For that moment, there is no hunger, no repression, only the joy and the need to dance. Once they have collectively abandoned fear for freedom, they are able to locate themselves as full citizens. We must respect and nurture the transformation of our members. There is a level of responsibility before, during, and after peaceful protest, especially under repression. We must have support and security structures in place. We plan for the worst case scenario and prepare to take people to the doctor or at least offer some care for their injuries. Providing practical care and encouraging members in their quest to overcome or at least manage their own fears is a crucial step in keeping people mobilized. In order to understand repression and how to manage it, we must also understand what motivates those who threaten and even attack us. Over many years of activism, I have become very familiar with police procedures and strategy, as well as the behavior and thinking of police officers. In my experience, rank-and-file police officers operate by habit, training and sometimes perceived orders or loyalties. They automatically want to repress because an authoritarian system is in place. Police officers at low levels in the command structure do not make decisions; junior police officers are trained to follow orders without thinking. There is little benefit in questioning the baton-stick holder’s cost-benefit analysis regarding beating this person or arresting that person. They do not think, and it is not their role to think. Sadly, some officers seem particularly prone to repression and have internalized it during their training. We often see the same police officers perpetrating abuse over and over, perhaps because of an addiction to trauma. I will never forget how once, when I was arrested and taken for fingerprinting, the police officer who was holding my hand and fingerprinting me said, “These are the hands of someone who is telling the truth.” He was still fingerprinting me out of habit even as he was declaring his belief that my actions were just. I was still charged, and I was sent to prison for three weeks. Strategic decisions do take place at a higher level of command, where officers must decide “What order should I give? How do I give the order?” or “How do I make sure no one sees that it is me giving the order?” Consequently, when we are in the street, we know that very few senior police officers want to be on the ground and seen doing the dirty work. We engage that level of our arresting police officers by demanding their names and details so that we can prepare for our legal cases of police harassment. We also mention that we will place a press statement on the internet mentioning their harassment. This has proven to be a good strategy for police at this level. The higher level police officer has to be dealt with on a legal basis by lawyers and occasionally cited in constitutional court challenges. We should also understand that the regime and its agents of repression are influenced by fear. In my experience, some of the police officers — if you watch them closely — have severe fear. I am not sure if it is fear of me, my colleagues, or what the chain of command will do to them. I know that our actions can create fearful dilemmas for them. They fear we will build a critical mass and then wonder what will be done with that critical mass. How will they fare as change unfolds? Interestingly, declining fear among activists increases fear on the other side. As that fear is increased, there is a tendency for agents of repression to employ more violence. Nevertheless, as ranking officers decide whether to employ the baton stick, they must also think about how they will maneuver through the reporting process that follows. They may fear for their own consciences and their futures, the kind of future the protesters are offering them. Will it feature retaliation or inclusiveness? Our tough love approach is one of the integral ways in which we have reduced repression or made it more likely to backfire on the police. We call the police to accountability while also signaling the kind of inclusiveness that only mothers could represent. We show love in our peaceful protest by holding our hands up in the shape of the letter L. Our commitment to love takes the sting out of some of the baton sticks. It is tough on the police to have such a loving protest converge upon their position. It is tough to have the whole of WOZA come loudly singing, carrying placards and making pavement speeches. But it is done under the banner of disciplining love. To ensure that love rules, we observe strict nonviolent discipline during marches. We also insist that members sign a code of conduct observing nonviolence in their lives. In every city block, or at the traffic lights, someone goes to the front of the protest group and chants a slogan asking protest participants to sit down and observe nonviolent discipline. This is an important message to all, including the police: “We are marching for the love of Zimbabwe, which means that we care about you. We are not a threat to you, but the love that motivates us is powerful and makes us committed to fighting for our rights and yours, too.” The observance of discipline is so pronounced in the movement that many times the police officers have to engage us to quiet the protest. They will come to one of us and say, “Please, can you keep people quiet now?” and so then we will be empowered by the police request. We then chant the slogan and sit the protest down. So the police now have to actually ask for our help to facilitate them addressing the protest participants. Nonviolent discipline helps us maintain moral authority — the high ground — and shows that we are prepared to continue our nonviolent direct action until our issue is addressed. It is tough love. It is love, but we recognize it is tough to be on the receiving end because it means you will have done something wrong needing discipline. The power to respond to repression relies on the ability of a dispersed network of activists to shift tactics. An activist movement can more easily change tactics than its monolithic adversary. Whereas the state uses authoritarian force and hard and fast command structures, our planning allows us to respond to the potential for violent repression by becoming more flexible and nimble than the police. Officers deployed to specific street corners have no latitude to change position without a highly militarized and bureaucratic chain of command, and low ranking officers are often too scared to make suggestions to their bosses. Dispersed networks of activists can more quickly shift tactics to cope with or blunt repression and implement a successful protest action. This ability to shift gears often stretches police resources or leaves them looking silly, standing on street corners in helmets with shields and batons sticks in the hot sun. When police occupied all our starting points in the central business district of Bulawayo on February 14, 2014, we knew that we could not pull off 10 smaller protests so we shifted and combined starting points so there would be higher numbers at three places and that our numbers might work in our favor to get the police to back off. The higher ranking police officers, seeing that we had higher numbers and the upper hand, tried to drive a huge truck into the road and threatened to run us over, honking loudly. Once again, we had to draw on courage and ignore this threat; we got the protest group to pack in close together and march away from the truck before it ran us over. This ability to restrategize (and a huge dose of courage) made for a successful protest. Repression management can involve elaborate proactive measures. For example, to ensure that police engage in more cost-benefit analysis before arresting someone, we have taken successful proactive legal actions against the police that remind them such repression can have predictable costs. In 2010, three colleagues and I sued the police commissioner for keeping us in filthy conditions in Harare police cells for seven days, making some of us remove our underwear. The Constitutional Court has ruled for a structural modification of police cells and that women cannot be forced to remove underwear or shoes. This kind of sanction of police requires lawyers who have an activist orientation and are brave enough to take on such cases. Through this legal challenge, WOZA has established an increased level of respect for rights for millions of citizens and possibly changed arrest procedures and practice in Zimbabwe. The experience of Women of Zimbabwe Arise provides a number of insights about repression and its management, notably the advantage of culturally resonant themes in a movement’s message, the ability to shift from a culture of fear to a culture of resistance, the importance of innovative leadership structures, and the value of being creative in relating to police. The basic impression management strategy of WOZA activists involved refashioning the traditional role of women in Zimbabwean society, which provided unique opportunities for action. Transforming the stereotypical motherhood role into one of political activism created a dilemma for government authorities, especially the police who were the government agents interacting with WOZA participants on a regular basis. Part of a mother’s role is providing tough love, a critical perspective, and direct confrontation over unacceptable behavior in order to benefit the child and the family. It is the mother’s job to correct, guide, and shape the behavior of family members who are damaging the social fabric of the family. WOZA expanded that domestic role into the public sphere, where authorities, who were usually accustomed to obeying their mothers, found themselves confronted and corrected in the streets for engaging in their official duties. This clash of roles made it difficult for them to use their limited repertoire of repressive acts successfully against the women of WOZA. Indeed, arresting officers were publicly shamed when they attempted to use incarceration as a way to suppress the movement, and we essentially arrested ourselves, piling into police vehicles to be taken to jail and thus grabbing even the authority to arrest away from the police. By responding to the authorities with love rather than fear — and expressing it with our iconic symbol of a hand sign making an L for love, we were able to manage repression more successfully. Showing the love sign while also practicing tough love was a successful action in transforming the culture of fear into a culture of resistance, empowering Zimbabweans to confront the regime and participate as citizens demanding democratic reform. This transformation of the emotions of fear begins with an acknowledgement that one is afraid — but then thinking about the options, such as what would happen if one does nothing — and then finding outlets. WOZA activists sometimes used singing and dancing, for example, as a way of expressing freedom in the face of repression, and these expressions of exuberance empowered us to carry on despite the danger. A third strategy for repression management was a creative leadership structure that enabled the movement to continue even when our most visible leaders were jailed. A dispersed leadership network was more flexible than the rigid authoritarianism of the security forces, so while we could adapt tactically to whatever situation we faced, they were constantly stuck with the same narrow set of options. This approach is related to a final central strategy for managing repression, an ability to understand the agents of repression and be creative in relating to them. The police were themselves responding with fear, and our tough love tactics could often disarm them, creating dilemmas for them and reducing their ability to repress the movement. Whereas the police establishment has a limited repertoire of tactics, the activist movement’s possibilities are almost unlimited, bounded only by norms against violence. In short, even the authoritarian regime of Robert Mugabe in Zimbabwe, with all of its resources — weapons, state power and security forces — has not repressed the movement. They could make our lives difficult and manage to postpone the inevitable collapse of the dictatorship, but they could never defeat us. Anyway, it was never about Mugabe and his ruling elite — it was not about a revolution. It was a story about EVEolution — women taking the lead and showing Zimbabweans that the power of love can conquer the love of power. 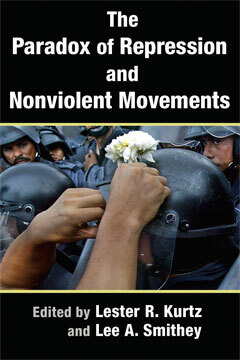 Purchase a copy of The Paradox of Repression and Nonviolent Movements at Syracuse University Press. Jenni Williams is the founder and leader of WOZA (Women of Zimbabwe Arise), one of the most active civil society organizations in protesting government abuses in Zimbabwe. Thank you so much Jenni for this eye opening and original piece. It is impossible to think of anything you have left out. The whole piece itself is worthy of a discussion topic in any group. Jenni Williams is a strategic genius and a wonderful person! It has been a real privilege to have worked with her as part of the paradox of repression team! When we reviewed the transcripts of our authors’ retreat at George Mason University, her name appeared with the most frequent insightful comments in a roomful of distinguished scholars.